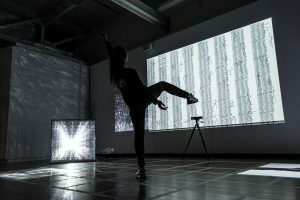 “The body as the limit of coding”, is an interactive life-size installation where a numerical system tracks and analyses the minutest gesture of the body. Visitors go through an experience inside this laboratory of physical exploration which transcribes their movements visually and into sound in real time through a network of neurons created in collaboration with InfoMus*, and mediated choreographically by a performer. By bypassing the computer code through the invention of unconventional movement qualities, visitors can bring the system to “crash”. The machine then calculates and collects the participants’ movements in the form of a score of gestural “errors” visible in the installation as a mirror interpretation. *Automated analysis of movement qualities with EyesWeb: Casa Paganini-InfoMus Research Centre, DIBRIS, University of Genoa, Italy. EyesWeb patches developed by Stefano Piana.